Sometimes following the best diet and exercise program is extremely difficult. To constantly gather the willpower to follow through, whilst fighting things like cravings, a poor state of mind, a lack of sleep and a constant feeling of hunger. Why not get a supplement that can help you with all the above? Naturelle Health’s Pure Saffron Extract claims to not only help you with your weight loss journey by naturally controlling your appetite and sugar cravings, but also by boosting your serotonin levels which improves your emotional state (especially effective for women during their menstrual cycle). It is also said to help you have a more restful sleep and combat stress in general. Read our review in Naturelle Health Pure Saffron Extract to find out more. Saffron Extract (88.5mg per capsule) is the main active ingredient in the product and is said to enhance the effects of serotonin. Saffron is commonly used as a spice extracted from the Crocus Sativus plant and is very labor intensive to harvest, making it the most expensive spice per gram. Saffron extract has also been known to aid with conditions such as asthma and joint health. These capsules are vegetarian based, and no gelatin is used. Unfortunately, the adequate daily value has not yet been established for saffron extract. One capsule is to be taken twice a day. It is recommended to take it 20-30 minutes before a meal to see the most effective results. Be cautious when using this as a pregnant or lactating woman, if you are under the age of 18 or if you have an existing medical condition. Rather be safe and consult your physician beforehand. 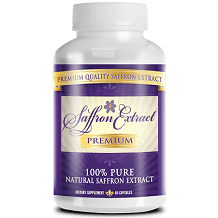 Naturelle Health mentions no side effects from taking their Pure Saffron Extract product. Saffron extract has been associated with side effects such as dizziness, dry mouth, headache, drowsiness, and nausea, but this is seldom, and a healthy adult should not experience these. This product is usually available online from Amazon but is currently not in stock and they are unsure when it will be again. The usual price is not displayed. Unfortunately, the manufacturers do not provide a money back guarantee. 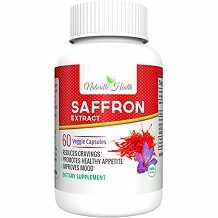 Naturelle Health Pure Saffron Extract seems to be a promising product to aid in weight loss by combating cravings, stress and poor sleep. Their veggie-based capsules make it vegetarian-friendly. Unfortunately, the manufacturers do not provide a money back guarantee, already decreasing our confidence in the product. Along with that, we found a few negative reviews on the product and with no stock available online, we cannot recommend this product. We recommend looking at other similar products on the market before making a final decision.